After the creation of the Manhattan and the Brooklyn, cocktail jealousy ran rampant in the remaining three boroughs. The Bronx and Queens were quick to follow with their own drinks, although few people remember them today. The Bronx Cocktail was invented sometime right around the turn of the 20th century, and it did add something very important to the American drinking repertoire. 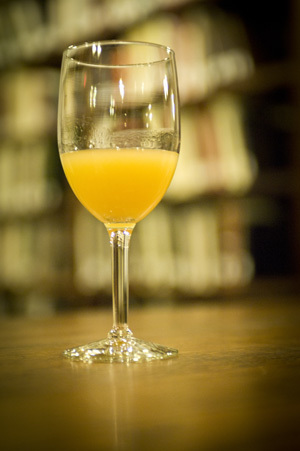 According to cocktail historian David Wondrich, it was the first drink to make the addition of fruit juice to a cocktail acceptable. Yes, drinks before this had a squirt of lemon here and there; but The Bronx took a good teaspoon of orange juice and mixed it with gin and vermouth. From this drink, all of our screwdrivers, mimosas, hurricanes, and cosmopolitans have spawned. I think the more appealing version of The Bronx Cocktail is The Queens. Instead of orange juice, gin and vermouth are combined with a muddled pineapple slice. The original recipe calls for mixing The Queens in a shaker, and straining out the pineapple, but I say why not just leave that pineapple piece in there. What’s it going to hurt? A drop or two of orange bitters is a lovely addition to this drink. Replace the orange with pineapple or pineapple juice for a Queens cocktail. The only borough of New York to lack a cocktail to call its own is Staten Island. So if you were going to craft a Staten Island cocktail, what would be in it? No cheap shots! (We love you, S.I!) I want a quality cocktail idea. Lets see so we have Gin, Whiskey, and Absinthe(? not a primary) accounted for. In an Ideal world 5 Burroughs – 5 primaries (Rum, Gin, Vodka, Whiskey, Brandy)(sorry Tequila but at the time nobody was gonna be drinking you) but whatever. Is that drinkable, I only have the rum here right now. That sounds freakin delicious. I would make it with apple cider. I just say juice to avoid the ambiguity of Cider and unfiltered apple juice people also call cider. If I were making it I would use the unfiltered “cider”. But i’m not sure how well Rum and Fermented cider would do (probably good! ), and also you would omit the soda since it’s already bubbly. Shall we try it this Memorial day? Yes, and I realized I misspoke! I meant the non-fermented stuff. Yeah, let’s give it a go Memorial Day. Someone else sent me a “richmond cocktail” – since richmond is the old timey word for Staten Island. It’s gin and lillet and a lemon twist. Bitters & hard cider over ice is such a good drink, by the way. Also: I can’t drink on memorial day until the sun goes down. Sun plus Heat plus Swimming makes me so sick. Cool I’ll bring the stuff. The key you see is don’t be active! Sit and drink in the hot sun!